People in Manchester and surrounding area have spent the week coming to terms with the tragic events of eight days ago. Books of condolences at Manchester Cathedral, the Town Hall, and other civic buildings around the area, were filled with messages from thousands of people. Department stores and supermarkets also instated their own condolences books, and at Lewis's store, a side passageway was filled with hundreds of bouquets and flowers. 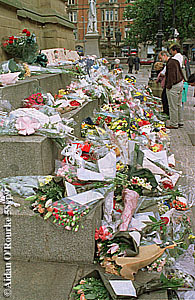 The cross outside the Cathedral (above) and the steps of the monument (left) to Albert, another well-loved royal who died young, became impromptu memorials to Diana, as people left messages, flowers candles and toys. Via the world media, you will have followed the revelations, and accusations which emerged through the week, but the mood here, as elsewhere, was one of sadness and resignation, mixed with a tinge of anger. Near St Ann's Square, I saw a young Manchester Evening News vendor being given a stern talking to by a member of the public. Resentment was also directed towards the Royal Family, who, as the eve of the funeral approached, were seen by many to have reacted insensitively. People were glad that the Queen chose to deliver an address to the nation, which was shown at 6pm on Friday. That evening, memorial services were held around the area, including one in Oldham, attended by hundreds of people, including representatives of all the major faiths. Very early the next morning, I, along with hundreds of others, took the Virgin Trains Inter City express to London. Have a look at my Eyewitness in London at Diana's funeral feature for pictures and words. During the day, many stayed at home and watched the service on TV. Others gathered at churches and other public places. That evening, in Manchester, there was a candlelight vigil in Castlefield basin, where hundreds of mainly young people stood silently in memory of Diana. 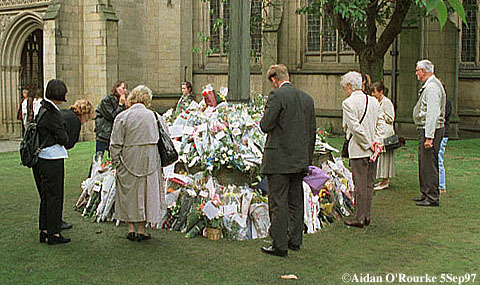 There was another memorial event in Albert Square, during which a purple flare was released from the roof of the Town Hall. Services were also held at places of worship around the city on Sunday, including Manchester Cathedral (right). Now the funeral is over, thoughts are turning to how Diana can be remembered. Many people are in favour of naming Manchester's new specialist hospital after her. The £60m unit is to be built adjacent to St Mary's Hospital and Manchester Royal Infirmary, pictured in last week's Newsletter. There have also been suggestions to rename the Arndale Centre in her memory, and Chorley Labour MP Lindsay Hoyle, has suggested changing the name of London Heathrow to "the Diana Princess of Wales Airport". Members of the public have also been making suggestions, featured in today's edition of the Manchester Evening News, including: renaming the Central Library; putting up statues of Diana in various locations in the city; a Diana Day holiday; an eternal flame at the cathedral; a statue in the peace garden near the Town Hall; the fifties record "Diana" to be re-released and the proceeds to go to charity, and many others. The idea of a "dead" monument, such as an eternal flame, was rejected by Councillor Richard Leese, Leader of Manchester City Council, on Northwest Tonight this evening. Like many people, he is in favour of naming a hospital after her, as has already been decided by trustees of the Liverpool Women's Hospital, which was opened by the Princess of Wales on her last official visit to the region two years ago. Please tell me what you think would be a fitting memorial to Diana in Manchester. A Manchester Evening News readers poll shows overwhelming support for the idea of scrapping the Millenium Dome, which is about to commence construction in London, and to build a children's hospital on the site instead. We'll have to wait and see if the government takes up this idea. As each day passes, Manchester returns slowly back to normal, though England, and for that matter the world, will never be quite the same place again, now that Diana has gone. The weather during the past seven days has been changeable, as ever, with blue skies and clouds alternating with rain. The autumn has all but started, with the first brown leaves appearing in the trees. The temperatures are fresh, but mild, around 61 fahrenheit or 16 celsius. Have a look at Euan Kellie's Manchester Rebuilding Website for some interesting pictures of the city centre as it looked before the bomb.